One of the resident bird species found in Mendocino County is the Band-tailed Pigeon (Patagioenas fasciata). The coastal subspecies (P.f. monilis) is commonly found at the UC Hopland Research & Extension Center during fall,winter, and spring months ... but the hot, interior summer weather seems to push it away. It is found, however, in most of the rest of the county during the summer, and it is a resident breeder (especially along the coast). There are at least 8 subspecies of this fascinating native bird found in western North America and parts of Central and South America. 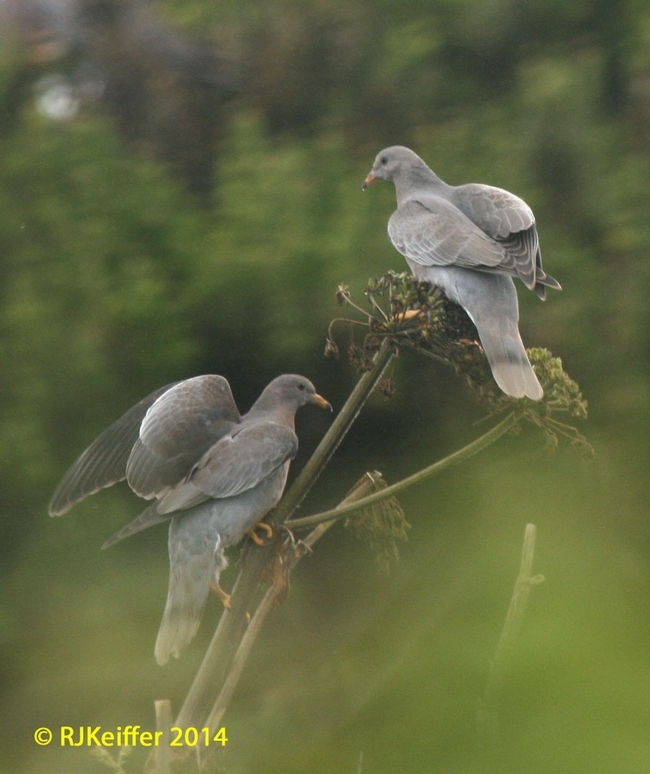 On almost all of these these the distal portion of the tail is very pale, showing as a "band" and hence the name "Band-tailed" Pigeon. To find out more about the population status and trends go to this 2012 USFWS report. The species is susceptible to various ecto (exterior) and endo (internal) parasites. The parasitic louse (Columbicola extinctus) was believed to have gone extinct with the extinction of the Passenger Pigeon, but was recently re-discoverd on the Band-tailed Pigeon. UC Davis Wildlife Health Center and the California Dept. of Fish & Wildlife have just discovered a new endoparasite named Trichomonas stableri. This newly discovered parasite, along with the long-known Trichomonas gallinae, have been found responsible for a recent major die-off of Band-tailed Pigeons. Trichomonas is a single-celled protozoan parasite. Find out more here about the recent discovery.